Safety Information CAUTION! Please read and follow the instructions in manual. Proper fit of the collar is important. A collar worn for too long or made too tight on the pet's neck may cause skin damage. These collars can cause pressure necrosis if used incorrectly and is often misidentified as burns. 1. Avoid leaving the collar on the dog for more than 12 hours per day. 2. If it's possible, reposite the collar on the pet's neck every 1 to 2 hours. 3. Check the fit of the collar to prevent excessive pressure; follow the instructions in this manual. 4. Never connect a lead to the electronic collar; it will cause excessive pressure on the contacts. 5. When using a separate collar for a lead, don't put pressure on the electronic collar. 6. Wash the dog's neck area and the contacts of the collar weekly with a damp cloth. 7. Examine the contact area daily for signs of a rash or a sore. 8. If a rash or sore is found, discontinue use of the collar until the skin has healed. 9. If the condition persists beyond 48 hours, see your veterinarian. These steps will help keep your pet safe and comfortable. Millions of pets are comfortable while they wear stainless steel contacts. Some pets are sensitive to contact pressure. You may find after some time that your pet is very tolerant of the collar. If so, you may relax some of these precautions. It Is important to continue daily checks of the contact area. If redness or sores are found, discontinue use until the skin has fully healed. 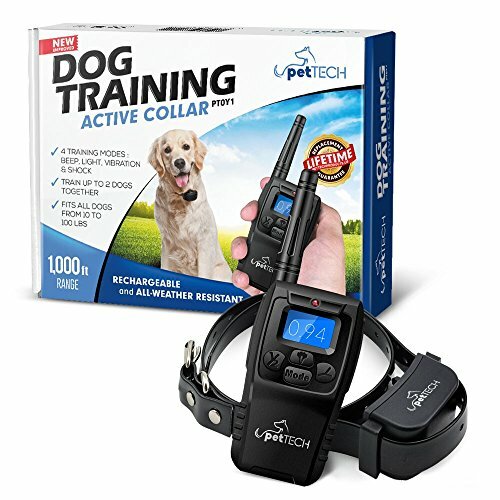 Shock Advisory The PetTech remote training collar is equipped with 4 training modes - light, beep, vibrate and static shock. Improper use of the static shock mode can cause pain, physical injury and traumatize your dog. The static shock feature should only be used in extreme situations and only after consultation with a professional dog trainer. We highly recommend using only the vibration setting. If you have any product questions or suggestions, or have concerns with a PetTech product you already purchased, we'd love to hear from you. You can reach us at (800) 930-2604. If you have any questions about this product by PetTech, contact us by completing and submitting the form below. If you are looking for a specif part number, please include it with your message.